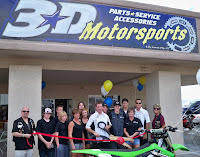 3D Motorsports celebrated its grand opening with a ribbon cutting ceremony by the Lake Havasu Area Chamber of Commerce Ambassadors. Darren and Renee Wallsmith, owners stock many band names including Oakley, Scott, Troy Lee Designs, Leatt, Jet Pilot, One Industries, Scorpion, and Maxima. Matt Shea, the GM has over 23 years in the industry along with mechanic Larry King who is certified in all makes and models including Harley Davidson, together they can help with all your parts, accessories and service for off-road, street and personal watercraft needs. Attending the ribbon cutting ceremony from left to right: Mark McKinnon, Devon Shea, Ciara Dunigan, Joel Thayer, Tammy Dunigan, Kristi Baldassari, Larry King, Matt Shea, Dylan Shea, Dylan Wallsmith, Derek Wallsmith, Renee Wallsmith, Darren Wallsmith, and Denise Johnk. For more information stop by the showroom at 669 N. Lake Havasu Ave., #100 or give them a call at 846-4743.